Scrap Copper Electric Motors consists of electric motors & small copper coil windings from motors less than 1 horsepower in size. 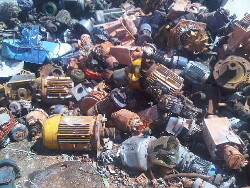 Electric Motors are some of the most common materials found in scrap yards. They consist mainly of copper windings and iron/other attachments. They are found in appliances, mechanical units, and tooling. Electric Motors are considered to be valuable scrap materials and can be sold to scrap yards and dealers at high prices, usually by the pound or by the unit.